← Not hummer-less yet . . .
Too much time has passed since my last post–my last remaining hummer departed soon after I made it, and the remaining flowers all succumbed to frost. Once the hummers are gone, I am free to begin the sequence of chores I go through to get my hummingbird garden through the long winter sleep. Many of the chores are related to overwintering the plants in my garden that are not hardy in my zone 4 climate. Most of my garden beds are devoted to plants that aren’t perennial for me, but there are various techniques for saving plants that won’t survive the winter outdoors uncovered. I employ four different methods for overwintering non-hardy plants–saving seed, overwintering cuttings indoors, digging up plants and storing them dormant in a cool garage, and “extreme mulching” of outdoor beds involving the use of bags of leaves and a tarp. I will discuss each of these methods in the coming days. I’ll get started today with saving seed. Saving seed is in many ways the simplest and easiest method for overwintering plants. Simply collect ripe seed from plants at the end of summer and beginning of autumn and store them in labelled packages in a cool, dry place over the winter. I got a deal a few years ago on a box of coin envelopes at an office store that I use for storing seed. I save a lot of seed, and I’ve made nary a dent in the number of envelopes in the box. Little space is needed to store seed and unlike cuttings, no maintenance is required over the winter–just store and forget them until you need to start plants from the seed in the late winter/early spring. Ideally you want to store your seeds in a cool, dry location. 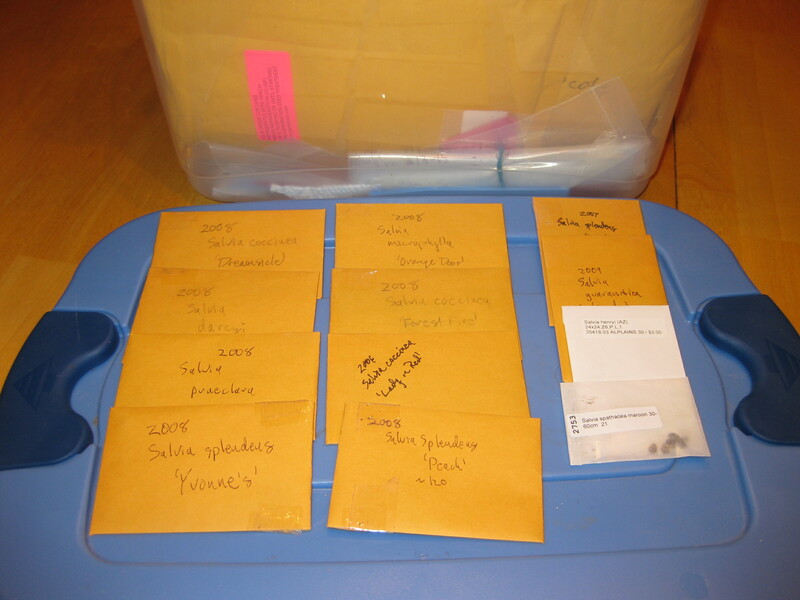 I keep my envelopes of seed in a covered plastic tub I keep in my basement, organized in large envelopes by types of seed to make them easier to find. Though storage is easy and carefree, it becomes much more work once you start the seeds indoors in the late winter or spring. Once you have germinated seedlings, you will need to water, thin, and fertilize them, harden them off, and generally fuss over them until they are ready to be planted out. This will require time, space, and equipment for an indoor light set up. I’ll be sure to post on this subject more in-depth in a few months once it is time to get seeds started. Overwintering plants in seed form is best reserved for those plants that come true from seed, and that bloom early enough in the summer to justify the effort. Probably the easiest hummingbird plants to start from seed are the various seed cultivars of Salvia coccinea (‘Lady in Red’, ‘Coral Nymph’, ‘Forest Fire’). Other good ones to try from seed include Salvia subrotunda, Salvia splendens (Yvonne’s Salvia), and Ipomoea x multifida (Cardinal Climber). I’m hoping that Petunia exserta will also turn out to be a good garden annual to grow from seed every year–I’ve got seed saved and will see how well they will germinate, grow and bloom in my garden next year. I noticed you did not follow up with posts on your other methods. Do you know what the temperature in your garage is where you store the guaraniticas? I’m having problems with my plants growing too much even in a cool basement, so I’m wondering if perhaps I could store them in a cold garage if I put them in insulated bins. I don’t know exactly how cold it gets in my garage. If it’s 15 below zero outside I’m sure it would be much less cold in the garage(although still well below freezing), but of course the garage door does get opened and sometimes left open, especially if I’m snowblowing or shoveling.